But only after being called out by (the terrific) stop stealing photos tumblr the real fun began. And by fun I mean god’s wrath unleashed in Jay’s twitter feed. Over the last few months we have seen several photographers borrow content from others, be it pictures or words, and I think that as a community we can definitely do better. sounds like plagiarism in its finest form. Especially as a photographer, you have to give credit where credit is due, thats just simple ethics. But he very well ruined his future in photography on his own. He advertised photos that weren’t his as if they were his own, he admitted to taking shortcuts when possible, and if he wanted to start a future in photography, he should have considered his own professional work. so in a way, its almost a blessing that he got outed before he screwed over allot of potential customers. 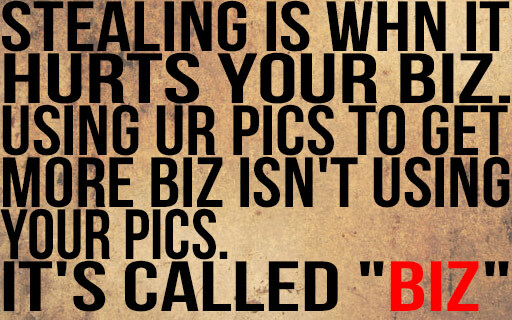 Besides, i wouldn’t trust anyone that uses the word “Biz” anyway. He’s a cheapskate if you ask me. Creative professionals are defined in their professional life by what they create. To clients and potential clients, I am nothing more than “the guy who made those images”. This is the worst thing about people stealing someone else’ words or images; it isn’t just stealing, using or misappropriating— it is IDENTITY FRAUD. It also isn’t the photographers who are the victims, it is the clients of the person who stole the images. They are paying good money to a person who has misrepresented who they are, professionally, and their abilities. As a photographer and a photography writer I believe in vigorously protecting my work and have been totally dismayed by some of the blatant rip-offs of the past several months. At the same time, however, I do take issue with some of the tactics used by the Stop Stealing Photos site. Rather than contact (apparently) offending individuals first and giving them a chance to do the right thing, the site rains hellfire down on them first and asks questions second. While looking through a photographer’s online portfolio recently, I came across a photo that I was initially convinced had been lifted from my own website. Even at second and third glance I could not be 100% sure. It was not until I contacted the photographer directly (and professionally) that it was sorted out. It was in fact his own photo– we’d both fallen victim to the old saying that “there’s no such thing as an original idea.” Had I gone the Stop Stealing Photos route, I could have easily– and wrongly– damaged a reputation that absolutely did not deserve it. I am not in any way, shape or form defending the fraud being committed, and I do think it needs to be exposed. I also think, however, that SSP’s approach shows a lack of professionalism. If you want to be a watchdog, great. The world needs watchdogs. But I’m a bit bothered by the “watch me be a watchdog” element. Especially if you shoot the underside of the Santa Monica pier. I have seen at least 6 unique captures that look the same when they are not side by side. I agree we have a responsibility to make sure we have been shot at before we shoot back. There’s always a way to deal with those fuckers. Let’s just hope that this douche gets sued by one of the victims, or lots of them. But it IS copyright infringement, and it IS unethical (and in most countries illegal). I disagree – its is theft, albeit in a non-traditional sense. If I take your car for a joyride, I’m still stealing it – regardless if I return it or not. Analogies are of course difficult. But in your example… It doesn’t matter whether they return it, because you still had the car all along. They just made a *copy* of it. Arguing with someone who blatantly says that he has done this to “shortcut” his career as as photographer and gets caught redhaned… deserves NO professional consideration… He would be receiving a call from my lawyer that same day. Our profession is competitive enough as it is to have the added stress of dealing with trash like that. As a victim of copyright infringement I find this neither funny nor sad. It’s bad enough when a non-photographer infringes on someone’s work for a blog, a website or some other use. It’s downright despicable when a “photographer” passes off someone else’s photographs as his own. The entitlement attitude this lowlife exhibits is offensive and disgusting. He thinks it’s okay to do what he did and then is offended when people rightly called him a thief? Douchebag is right! Using anothers work and passing it off as your own is fraud stealing. That’s it. plain and simple. If I booked him based on what I saw then he produced nothing like it I’d be asking questions and asking for my money back. And posting reviews on his so-called ‘professionalism’. Appart from that, his attitude smacks of the current X-Factor instant-hit shortcut-to-fame that we see everywhere these days. In the music industry bands no longer want to do the hard graft up from the bottom, and lay good solid foundations, build a good fan base, learn the industry – but want instant success. Trouble is that sort of success doesn’t last. Same thing here. If you want longevity – work for it like the rest of us. Build your reputation rather than climb up by treading on everyone else’s head and potentially damaging their business in the process. On top of that, who would want to do any collaborative work with him? I’m not a pro but would dearly love to be, but don’t think I’m good enough. But it would be on my own work that I stand or fall – not someone elses.